Have You ever heard of Dry Erase Paint? My name is jay and I am a professional painting contractor. I came across a brilliant product and wanted to a moment to tell you about ReMARKable. This is a major breakthrough. 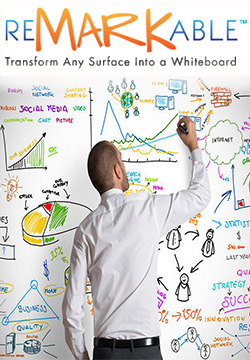 Dry Erase Paint or ReMARKable is the revolutionary product that turns any surface into a white board. Giving you the chance to let your creativity flow out onto nearly any surface imaginable. You dont have to settle for white either, ReMARKable offers their Clear Choice Alternative. Clear Choice is a clear version of ReMARKable that can be applied right over your existing wall color. Giving you a limitless selection of colors to choose from. Dry Erase Paint is simple to use. ReMARKable products apply like any paint, but you do need to mix two components together to give ReMARKable its white board like properties. ReMARKable can be written on after 48 hours of dry time. Because of ReMARKables durable finish it lasted in some instances for 10 years before it needed to be painted again. ReMarkable also gives schools, businesses many others a more environmentally friendly alternative to large sheets of paper or excessive handouts, memos etc..
For best results, use ReMARKable over a solid, painted wall. For surface prep, repair any divots, scratches or bumps on the wall so the surface will be as smooth as possible. If you have applied a fresh coat of paint prior to applying ReMARKable, make sure to let the paint dry a minimum of 24 hours before appling ReMARKable. Do not apply ReMARKable directly over primer alone. The better the prep, the better the finish. For best results, use a 1/4″ smooth nap roller. With proper maintenance and normal wear and tear, ReMARKable retains its dry-erase ability for 10+ years indoors before you ever need to recoat the surface. It’s guaranteed not to crack, peel, stain, yellow or fade with proper use and maintenance. If you ever find that you do not need your ReMARKable surface, you can simply paint over it just as you would do any painted wall. Lightly sand the surface, prime and then paint. To remove ReMARKable from skin, use warm water and soap. To remove ReMARKable from a surface, you will need to use an abrasive material, such as steel wool or sandpaper, to remove the material. 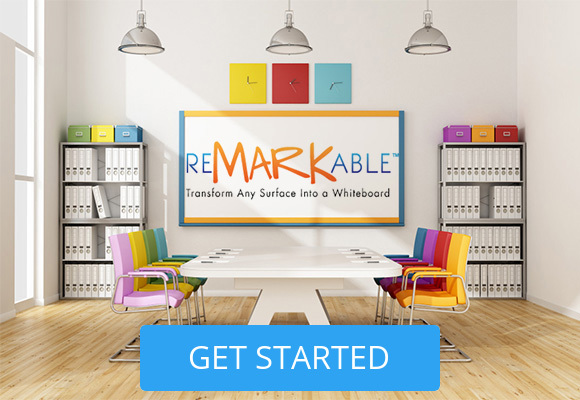 ReMARKable™ works with any low odor dry-erase markers. Erase it with a micro-fiber cloth. To accelerate or enhance the cleaning process, use our ECO-Friendly ReMARKable Cleaner. Spritz a small amount on the area to be cleaned and wipe with a ReMARKable Cleaning Mitt or other micro-fiber cloth. Then wipe with a towel saturated with water to remove any residue. Using a paper towel, dry the surface and you’re ready to write.